Santorini is one of many Greek islands and is one of the most famous. It is popular because of its beauty and outstanding views - this makes it a popular tourist destination and it can sometimes be quite crowded. Most visitors arrive during the peak summer season when many schools have breaks. Accommodations can sometimes be hard to find, so book as early as you can. Winter is cool and rainy, but if you don’t mind this, you’ll find an uncrowded island with few visitors. The spring and fall are the best times to visit Santorini, Greece because the weather is pleasant and there are few crowds. In January, Santorini sees its coldest temperatures in the year. The average high temperature measures in at 57°F (14°C) while the average low temperature is a cool 50°F (10°C). February sees both high and low temperature averages hold steady at 57°F (14°C) and 50°F (10°C) respectively. Santorini Weather in March: The temperatures increase in March with the high temperatures increasing to 61°F (16°C). The low temperature rises a few degrees to 52°F (11°C). Meanwhile, Santorini sees an average rainfall of 40 mm. April sees the temperatures increase all around with the average high temperature climbing to 64°F (18°C). The average low temperature, likewise, increases to 55°F (13°C). In May, the rainfall averages fall to 11 mm. High temperatures make a significant jump to 73°F (23°C). Meanwhile, the low temperature average makes a similar climb to 63°F (17°C). 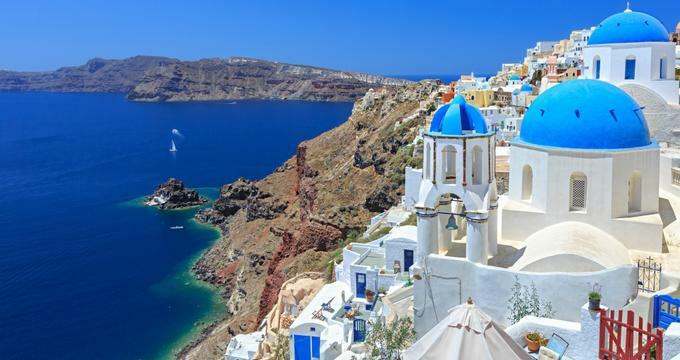 June is the driest month of the year with Santorini expecting no rainfall at all. The general climate warms further with the average low and average high temperatures ranging between 70°F (21°C) and 81°F (27°C). 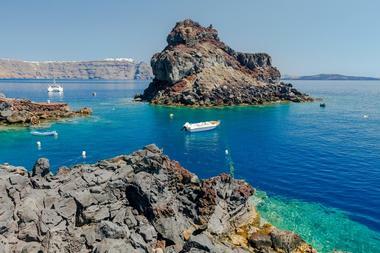 Santorini Weather in July: It’s a hot month in July with Santorini seeing its highest temperature averages in the year. The high temperature rises to 84°F (29°C) and is matched by the highest daily average of sunshine annually – 14 hours per day. The low temperature is 73°F (23°C). In August, the average high and average low temperatures remain the same at 84°F (29°C) and 73°F (23°C) respectively. It’s arguably the best month to head to Santorini’s beautiful beaches with sea temperatures at 77°F (25°C). September marks the beginning of a downward trend in average temperatures. The average high temperature drops by 5 degrees to 79°F (26°C) while the average low temperature decreases a few degrees to 70°F (21°C). In October, Santorini receives a moderate amount of rainfall with precipitation averages at 38 mm. The average high and average low temperatures measure in at 73°F (23°C) and 64°F (18°C) respectively. Santorini Weather in November: The climate cools further in November with the high temperatures decreasing significantly to 66°F (19°C). Similarly, the low temperatures drop to 57°F (14°C). December receives the most rainfall of the year with a precipitation rate of 75 mm. The climate cools further with an average high temperature of 59°F (15°C). The average low temperature is 52°F (11°C) and is accompanied by 6 hours of sunlight, the lowest daily average sunshine in the year. The best time to visit Santorini for swimming, sun tanning and water activities in general is between the months of June through September. During this time, it’s sunny and hot in Santorini and the water temperatures are at their best. For travelers that are keen on sightseeing, the best time to enjoy the best of the views, wineries, sights and more is during April to May or October until early November. Money conscious travelers will score the best deals in Santorini during the low season of December through March. Olympic Air provides daily service between Athens and the Monolithos Airport, Santorini’s airport. There are also chartered flights from other places in Europe as well as domestic flights to other Greek islands such as Crete. 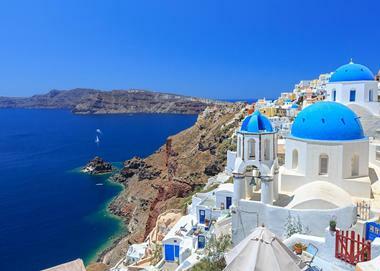 Aegean Airlines also flies daily between Athens and Santorini. Skala is Santorini’s cruise port: many people arrive in Santorini on cruise ships. It is an exposed port, so cruise ships anchor offshore and passengers are taken to the island on smaller boats. There is a ferry service from Piraeus, Athen’s port, to Santorini two times a day; there are also catamarans that are much faster. Ferries dock at Athinios on Santorini. Santorini has one form of public transportation and that is the local bus system. You can take a local bus from the airport to the main bus station in Fira, the capital of the island. The rental car agencies are located at the Arrival Halls at the airport: here you can rent a car to get into Fira and to visit other places on the island. There are many shuttle and taxi transfer companies that will take you into Fira or to any hotel or village on the island. It is a good idea to pre-arrange transportation if you choose not to rent a car at the airport. One way to get around Santorini is by bus. These can be slow and infrequent, so the bus system is probably not the best choice for visitors who are in a hurry; but it is a great way to see the island and get from Fira to another village inexpensively. If you rent a car at the airport, you can drive around the island to see the attractions. Parking can be difficult in Fira and parking in a no-parking area will result in a steep fine. Many visitors enjoy seeing Santorini by moped. These are easy to rent but remember that you will be sharing the road with fast moving vehicles. 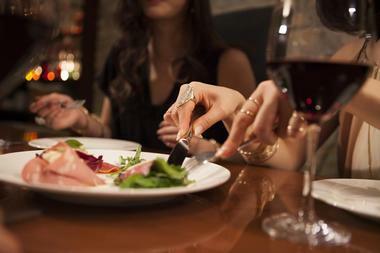 Many of the restaurants in Fira cater to visitors who spend just one night and then move on to another Greek island: the food at these restaurants is usually not as good as the food at the restaurants that are frequented by local Greeks and returning visitors. Corner Crepes serve breakfast and quick inexpensive meals; Lithos serves homestyle dishes at affordable prices; and Camille Stafani is a popular local taverna. If you want to venture out of Fira, check out the fish tavernas in Ammoudi which is Oia’s port. Katina is a fish taverna at the bottom of the cliff and, on the way down, Kastro serves fresh fish, pasta, and Greek dishes. 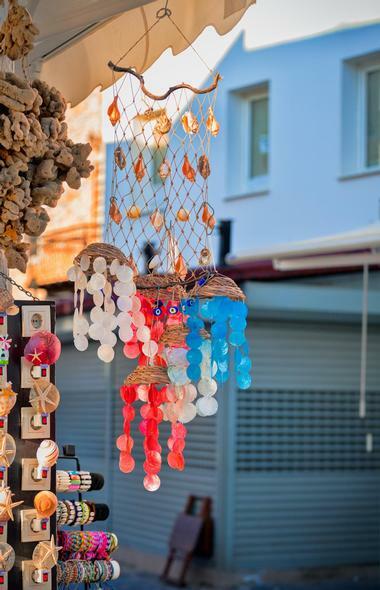 Santorini is full of souvenir shops, but there are some other more interesting things to look for during your stay here. Kostas Antonious is the island’s best known jeweler; and Porphyra also offers beautiful jewelry creations. The Bead Shop sells pieces that are carved from the island’s lava while Nakis sells amber jewelry some of which have insects embedded in them. Some people go to Oia to buy wine: there is a large selection of wines here including locally produced Santorini wine. Other things to look for include Greek hand painted pottery; books at the Atlantis Book Shop; and pieces of sculpture at Mati Art Gallery. 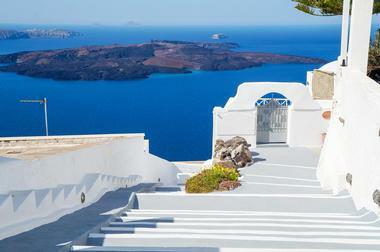 Santorini is made up of several neighborhoods starting with the capital city of Fira. Here there are cobblestone streets, boutique shops, accommodations, and museums. 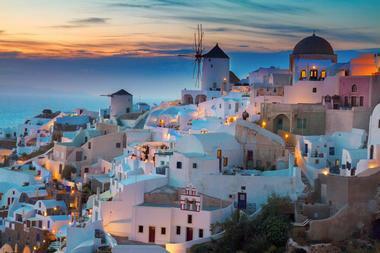 Oia is a town about ten miles north of Fira and is known for its breathtaking sunsets. After an earthquake in 1956, the residents decided to rebuild their town by carving the buildings into the sides of the cliffs. The white-washed walls of the cave hotels attract photographers and honeymooners. Everything in Oia is more expensive than in Fira. 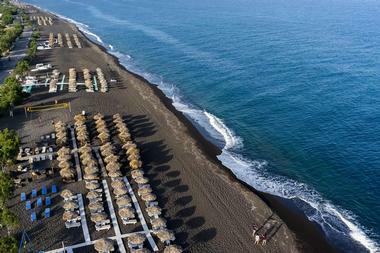 The cities of Kamari and Perissa are known for their black sand beaches while Akrotiri is known for its red sand beach. 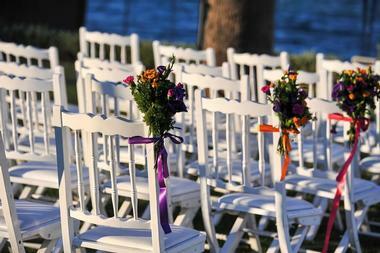 Because of its spectacular beauty, Santorini is a very popular place for a wedding. Foreigners can get married in Greece: there is a fair amount of paperwork that is involved, but after you finish with all of this, it’s time to look for your perfect wedding venue. Some of the popular wedding venues include Le Ciel Santorini perched on the top of the caldera and featuring beautiful sunsets; the Theros Wave Beach Bar with its hidden southern beach location; Dana Villas in Firostefani with its fantastic wedding terrace and views; and the elegant Santorini Princess Hotel with its pool, open air lounge, and superb views. Santorini offers a wide variety of accommodations from five star hotels to simple guest houses and inns. Some of its luxury properties include the Andronis Luxury Suites, the Canaves Oia Hotel, the Cavo Bianco, the Katikies Hotel, and many others. There are other special places to stay such as 1864 The Sea Captain’s House with it vaulted ceilings and weathered wooden floors; the family run nine room Astarte Suites located in the least-developed part of the island; the Canaves Oia Santorini set in a former 17th century winery; and the Chromata with its 26 colorful rooms and an infinity pool.